« Its six inches long ….. Many years of working as a coach to wealthy executives has taught me that self-esteem doesn’t come from what you own, it comes from what you create. I’ve also learned that self esteem can’t be measured by money, but it can be measured by the number of lives that are impacted. It’s why so many successful people keep creating, keep impacting lives and keep smiling. Billionaires such as Ralph Lauren, Sir Richard Branson and JK Rowling could easily pack in their day job, but choose not to. It’s because they’re having too much fun expressing themselves and creating their art. Ralph Lauren was asked "Don’t you find it stressful working 12 hours a day at the age of 74?" His reply: "Stress isn’t working 12 hours a day doing a job you love. Stress is working 8 hours a day doing a job you hate." Ps. 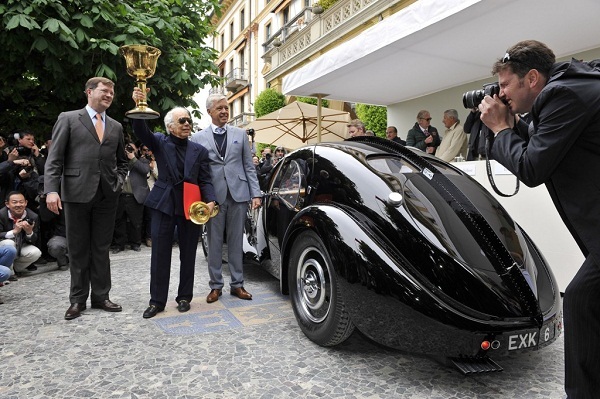 the gorgeous car in the above photo is Ralph Lauren’s 1938 Bugatti Atlantic. The Mexican maid asked for a pay rise. The Missus was very upset about this and decided to talk to her about the completely unjustified raise. Mrs: “Now Maria, just why do you want a pay increase?" Mrs: “And just Who said you iron better than me …?" Maria: “Jor huzban … he say so …". Mrs: “Nonsense, what utter rubbish; and Who said you were a better cook than me …?" Mrs, increasingly agitated: “Oh he did, did he …???" Mrs, really boiling now, and through gritted teeth: “And, did my husband say that as well …?" Mrs: “So how much of a raise were you wanting …?" This entry was posted by admin on April 6, 2014 at 7:17 am, and is filled under Sunil Bali, The Art of Awesome Living, The Book of Awesome Humour. Follow any responses to this post through RSS 2.0. Both comments and pings are currently closed.